This is a high quality photo print of Greg's original painting ‘Gandalf Visits Bilbo - 2018 Commission’. It is printed on 13” x 19” premium luster photo-paper. 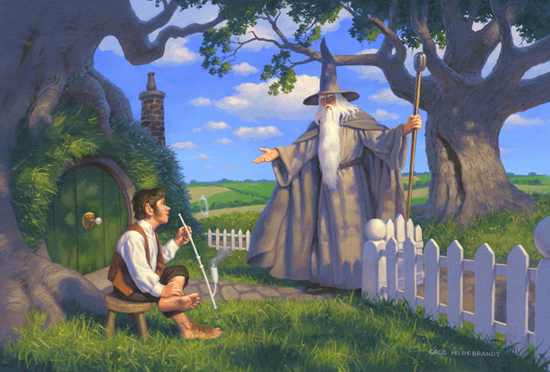 Gandalf visits Bilbo was originally painted in the 1970s for the 1976 Tolkien Calendar. A beautiful image, it has long been sought after by fans everywhere. This painting, a modern recreation of the original, is a commission painted by Greg in 2018. Greg has often been asked to create paintings based on a piece he has done before. However, Greg loves a challenge, and likes to create something new every time he paints. Decades later, Greg’s painting style and approach to color has evolved over the years. This is a completely new view of Middle-Earth!